Although I was skeptical of This Is Not a Test at first because of the zombie plot (which has become quite tiring within the past few years), this novel completely blew me away. It's fast-paced and very engaging, and once I started reading, was driven to read it straight through the night and into the following morning. 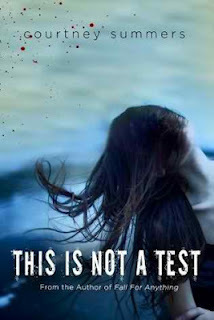 This Is Not a Test is written in the first-person narrative from Sloane's point of view, and is broken up into sections and chapters of appropriate length to hold the reader's interest. Sloane's character is not as "emo" and pathetic as I expected her to be, but intelligent and broken considering her circumstances and family background. In fact, Sloane's character is the determining "make or break" factor of the book, and is so tastefully and smartly written that the book is a winner, in every aspect. As I read This is Not a Test, I found myself itching to know the book's final outcome. In no way is this novel predictable, and the ending is oddly satisfying after a very action-packed experience. Teenagers and adults alike will love This Is Not a Test! I highly recommend it for fans of horror and zombie-fiction. The novel is dark, horrifying, creepy, and subtly romantic all at once. If you enjoyed reading Markus Zusak's The Book Thief, you will probably also enjoy This Is Not a Test. Although the plot subjects are vastly different from one another, I immediately thought of Zusak's novel upon finishing This is Not a Test. Other novels by Courtney Summers include Fall for Anything (2010), Some Girls Are (2010), and Cracked Up to Be (2008). What are your favorite zombie-apocalypse novels? Share your suggestions with us in the comments section below! Great review! I am wary of zombie books too, but this one sounds good. I am sick of seeing the zombie books everywhere I look, especially the classics that have phrases and names replaced with zombie incidents and names.